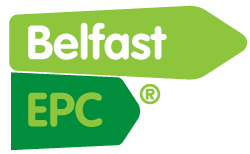 An EPC or Energy Performance Certificate is a legal document that is mandatory in Northern Ireland, when someone is selling or renting their property. The EPC must be available for display before the property is marketed or advertised, meaning it is the first step on the selling or renting ladder. It will contain information regarding a property’s energy usage and typical energy costs, based on a rating from A (most efficient) to G (least efficient). What information will the EPC provide? The results of the EPC are calculated based on the assumption of standard dwelling occupancy, which enables the energy efficiency of one property in comparison with any other property, disregarding size, shape or location. This makes it possible for prospective buyers to compare the energy efficiency , carbon emissions and fuel costs as part of their investment decision. e.g. the fitting of low energy light bulbs, or the installation of TRV’s Thermostatic Radiator Valves. e.g. the conversion from and old oil boiler system, to a top of the range modern condensing gas boiler, or cavity wall insulation. Voltaic (PV) or Solar Panels fitted on the roof. These costs can usually be measured from £4000 upwards. The EPC will show two results, the current rating and the potential rating for your property. The potential rating is calculated, on the potential energy, carbon and monetary savings which can be achieved if all of the suggested energy saving measures are implemented. None of the home energy improvements suggested are compulsory to undertake, they are simply a guide showing the best measures to reduce home costs, while looking out for mother nature.